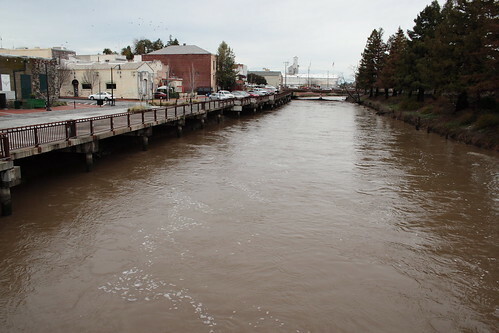 This is the Petaluma River in downtown Petaluma. Normally the river is several feet lower, but heavy rains on Friday pushed the river to flood stage. This shot was taken several hours after the rain stopped and the river had actually started to go down. Petaluma didn’t have any major flooding, just the normal amount in the lowlands of the river basin North of downtown. Some parking lots and roads were flooded, but no there was serious damage that I heard about. Flooding is pretty much a yearly event here. Some years are certainly worse than others, and compared to the December 31, 2005 flood, this weeks flood probably won’t be remembered as a “flood”. The river just got to really, really high. I live in an area above the flood plain so thankfully never have to worry. As a community however, seasonal flooding is something we all think about. Many streets in town get flooded because the run off has nowhere to go because the river is full. Businesses in the flood plain have to sandbag, commuters get stuck in snarled, flooded roads, and sump pumps in basements are working overtime. Many people point to growth in the flood plain as a primary reason for flooding. The controversy has been ongoing for decades as far as I know. There hasn’t been real development in the flood plain in recent years, but there has been development in areas near the flood plain that have probably made problems worse. Taken as part of the 2008 Challenge (although I’m a week behind). This entry was posted on Sunday, January 27th, 2008 at 3:00 pm	and is filed under 2008 Challenge, Outdoor. You can follow any responses to this entry through the RSS 2.0 feed. You can leave a response, or trackback from your own site.